This time Facebook is extending its control and now every single page needs permission to send out subscription messages. This way it is easier to protect the users from unwanted messages. If you want to keep sending out subscription (non-promotional) messages to your users, you’d need to get approved for this. If you read this in 2019, this is a necessity to be able to reach your audience for free on scale. So here’s how you can obtain the permission. Go to your business page’s settings then access Messenger Platform from the left side of the webpage. Depending on where you have access to it. I believe you would need editor access to the page at least, only tried as an admin, so not sure. Once clicking on ‘request’ a pop up will ask you what types of messages you’d like to send and offers three places to fill to explain it and give examples. Most of the readers here need to choose News as the main category. Here is an example what we had for Chatbot Tutorial. It’s just to show what we think could be good for a business like ours, feel free to take ideas from it and adjust it to your business. I think it helps if you describe in details how you are bringing value to your list also proper sentences and grammar won’t hurt. Tip: use Grammarly. Chatbot Tutorial is engaged in helping businesses become more flourishing with Messenger marketing. It provides training on Messenger bots and gives detailed instructions on achieving the best user experiences with the help of videos, articles, and templates. Subscription messages go out once there is a bigger news from the world of chatbots that is relevant to the user or when we can provide new, helpful content. Maximum twice a week but most of the times even less. These messages are easy to opt out from and are personalized to some extent delivering relevant content and never promotional in nature. Keep in mind that your approval depends on another human being, who represents Facebook, so appreciate and be thankful in advance for getting the review. You also need to provide at least 2 example messages for what your page is sending out. The easiest way to do is to go to your broadcast history and just copy paste 2. Should you not have these, or worse, your messages don’t align with your policy, just provide some examples you could send out in the future. 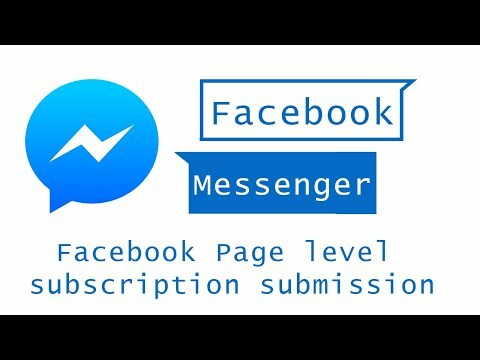 If you’d like to send out subscription messages in 2019 as well, you need to get approval for the Facebook page you use. Here’s an article helping you out on submitting your request. Janis came out with a new feature for Chatfuel users. From now on you can ‘push’ certain blocks directly from Slack while chatting with your customers. Click on ‘watch now’ to see the video displaying this new functionality. Regarding the about page info. I suggest you base your texts on the recommendation of Facebook. Here’s it for copy and paste for convenience. We need gender to be able to render pronounce in certain languages. People all over the world send us messages and we want to communicate with them in their native language. We will be sending news updates and we want to send them during certain times of the day. Afterward, tick the box for confirming the policy (you should actually read it before doing so), save your draft and click Submit for review. In a few hours or days, you will get approved for submission! Sometimes it may happen that you get denied. Facebook will provide an example where they think you failed and give you another shot to apply, so don’t give up, just learn from it and keep on requesting submissions while applying common sense and these tips. Update: Seems like submission times are longer now, we have been waiting for over 2 weeks for some pages. Send your request in as soon as possible. Update 2: 4th Dec. : Facebook has extended the deadline as they couldn’t keep up with the many submissions, so we can still send out broadcasts with ‘app-wide’ permisson in 2019 for a while.